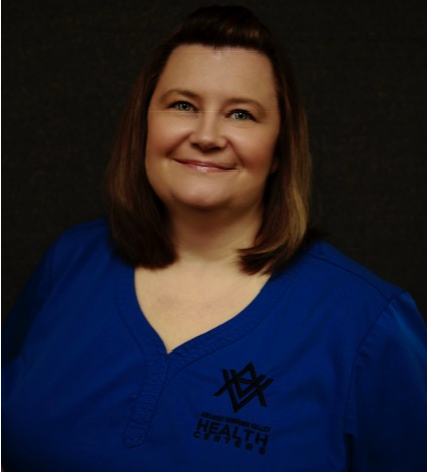 Please join us in celebrating Christy Brandon, Licensed Practical Nurse (LPN) at Arkansas Verdigris Valley Health Centers in Porter, OK. Christy is Equiscript's Site Champion Spotlight for January! Equiscript Account Manager, Tiffany Green, and Client Relationship Manager, Brandy Johnson nominated Christy Brandon, an LPN at Arkansas Verdigris Valley Health Center. Tiffany said, "Christy is hardworking, passionate, and dedicated to helping those in the community and patients of Arkansas Verdigris. I am grateful to be able to work alongside her and her team to serve a common goal." Christy said, "Being a Site Champion is a wonderful opportunity for me to help not only our patients to better their medication compliance, but it allows me to assist our providers to manage patient medication fills and refills in a more timely manner." She added, "I love that this program is so helpful to our patients making their medications more accessible to them and I am able to be a part of this wonderful process." For Arkansas Verdigris Valley Health, Christy identified cost as being one of the main barriers to care for their patients. She said that the health center does everything they can to help and that the Equiscript home delivery pharmacy program is "very valuable" because "It helps cut down on cost as well as assisting patients to be more compliant and independent with their medications as some patients depend on others to pick up their medications for them." With the responsibility of being an Equiscript Site Champion, our Site Champions often develop a process for managing the added tasks. Christy found that "...one of the things that makes it easier on me is to pull up my portal daily and leave it open, checking it throughout the day in between tasks as able." Often, daily monitoring is not necessary, but it is one of the reasons Christy was nominated for Site Champion of the Month. Equiscript Client Relationship Manager, Brandy Johnson, said, "Christy is always so on top of things, leaves notes, and communicates well. She does it all while maintaining her regular responsibilities, and with a smile on her face." Site Champions help to ensure that patients get the best quality service, and that they get their medications when they need them - which keeps patients happier, healthier, and more compliant with their healthcare. Thank you, Christy, for being a top-notch Site Champion!